Azusa Pacific University's affords its residents easy access to the popular mountain and beach resorts of Southern California and all of the cultural attractions of Los Angeles County. Students enjoy visiting Disneyland, Magic Mountain, Knott's Berry Farm, Universal Studios, and the major television studios. Desert resorts are less than a two-hour drive from the university. For thrill seekers of all ages, Six Flags Magic Mountain, Knott's Berry Farm, Universal Studios, Raging Waters, Medieval Times, Disneyland, and Disney's California Adventure offer a truly amazing, amusement experience. To experience the epitome of Hollywood, head to Hollywood and Highland to see the legendary walk of fame, stroll along theater-lined Hollywood Boulevard, or even witness a recording of a TV show in Studio City. Other places to see the "stars" shine at day or night include the Hollywood Bowl, Greek Theater, and Universal City Walk. Hollywood also offers APU students the opportunity to serve as interns with various production studios. The Los Angeles International Airport (LAX), ranked fifth in the world for number of passengers transported, serves the five-county Southern California region. Its convenient location and modern facilities are accessible by bus, light rail, taxis, and shuttles. Photo by Jay Berkowitz, Los Angeles World Airport. The Ontario International Airport (ONT) is a medium-hub, full-service airport with service to major U.S. Cities. Located approximately 12 miles east of Azusa, access is simple and speedy. Many APU students hike nearby Garcia Trail in the San Gabriel Mountains, a favorite for its easy accessibility. The short but semi-strenuous hike provides a bird's-eye view of the valley to the south and the APU campus. In addition to hiking, the San Gabriel foothills offer numerous opportunities for mountain biking, rock climbing, camping, and fishing. “The Happiest Place on Earth” is an enchanted kingdom of fantasy and imagination filled with classic family-friendly attractions and magical entertainment, dining, and shopping. Right next door are Disney’s California Adventure and Downtown Disney. The city of Newport Beach is known to have some of the most beautiful beaches in Southern California. 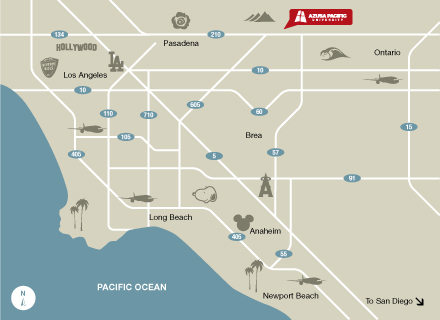 It is located midway between Los Angeles and San Diego and is easily accessed by the 55 and 73 freeways. With mild weather virtually year-round, all Southern California beaches, including Huntington, Balboa, Seal, Laguna, Venice, and more, offer swimming, surfing, volleyball, sunning, and relaxing for all. Learn more about the city of Los Angeles at http://lacity.org/.